A|Wear, Ireland's favourite homegrown fashion brand, is now available to the rest of the world too - they recently introduced worldwide shipping from awear.com, and their clothes are also stocked on ASOS. So it's entirely fitting that today's fab giveaway is open internationally. One lucky reader of Fluff and Fripperies will get their hands on that gorgeous tan handbag, worth €38 (check it out here) as well as a €50 gift card that they can use in store or online. To enter just follow the simple steps below - best of luck y'all! Ooooh love that bag! Love a-wear also, very disappointed there are none in London! I have a plethora of brown slouchy bags, but one more wouldn't hurt! I'd love to win please. Thank you! Love this prize! Exactly what I need now! Aw Emma!!! You are a legend! And I was only saying how A Wear have a lot of gorgeous stuff lately. Great prize. Ah Awear I do love them! Wow, I'd love to win this! Need new clothes stat! Have not been near A/Wear in ages! This would be brill! I haven't been into awear in a while but I adore their A/W campaign photos, the models hair is to die for! New outfit and hanbag definitely needed! Cant go wrong with a tan bag! Awesome! Where/how do you get all these amazing prizes?! Emma, you're such a legend! 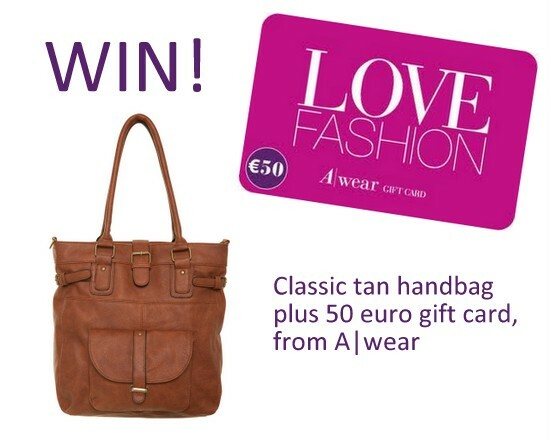 I'd love to win this and get some really lovely winter clothes for college, the tan bag would come in handy too :). Wish I had your job, I'd make everyone as happy as you do with these gorgeous prizes. Another excellent prize....I love, love, love A|wear, my fav shop. Oooh lovely giveaway, I love that bag!! Amazing prize, quick question, when and where will the winner be announced ? A good bag is essential. AWear have some gorgeous new pieces in, I was in the shop the other day coveting everything! Excited to learn more about this company, this bag is adorable! omgggg....you are being tooooo generous! the giveaways are crazyyyY!!! I miss A-Wear so much since I left Ireland to go on Erasmus! Giveaway overload. Wow! Just wow! great giveaway!! Thank you so much! love love love this !!! Brilliant giveaway! enter me please!